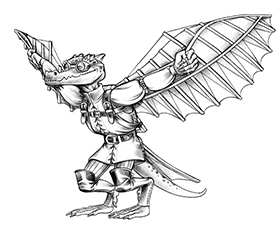 Kobold Quarterly #11 (on sale now) offers rules for using madness and sanity, in the article “A Broken Mind,” for 4th Edition. However, fear not 3rd Edition fans, for right here and absolutely free are the the same rules built for Pathfinder Roleplaying Game! Why break bones, when minds are so much more fragile? Using sanity in a fantasy game can be tricky. It’s not the real world, so where do you draw the line between the mundane and the hysterical? Adventurers in D&D are supposed to bravely go forth and kill monsters. That’s a bit more difficult if every creature you see makes you turn tail and run, so a line has to be drawn. Certain creatures need to be assumed common enough that sanity doesn’t come into the question at a mere glance. For these rules, that line is the natural world as defined by the cosmology of Pathfinder Roleplaying Game. That means that some really creepy monsters won’t affect your characters the way they might you or I in real life; they are part and parcel of the natural environs of this fantasy world. 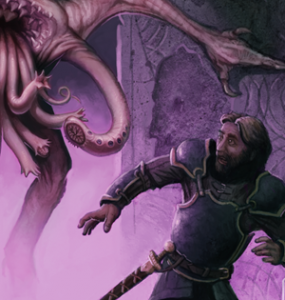 Those monsters—such as the bulette, the shambling mound, and the gelatinous cube—will just have to resort to old-fashioned techniques of brutalizing adventurers. That line I drew? Wonderfully, it’s movable. Whenever you need to ramp the craziness up or down, it’s easy to adjust which monsters are just part of the “landscape” and which ones simply melt the sanity from your head. You start adventuring with a Mind ability score and a pool of Sanity. Your Mind is treated as a seventh ability. Because it is derived from other ability scores, you need not put points into it; determine your standard six-ability array first, using whatever method you typically use. Its value is decided at character creation by choosing the highest of your Charisma, Intelligence, or Wisdom. After character creation, your Mind is no longer linked directly to this other ability score. You may increase your Mind as you gain levels just as with other ability scores (such as at 4th level, 8th level, etc). Your starting Sanity—the primary currency of madness—is equal to five times your Mind score (or 5xMind). Skills. Perhaps counterintuitively, it is knowledge that limits your sanity. As you understand more about the multiverse around you, you are potentially less capable of coping within it. Your starting Mind is permanently decreased by 1 point for each of the following skills you are trained in: Knowledge (arcana), Knowledge (dungeoneering), Knowledge (planes), and Knowledge (religion). If you become trained in one or more of these skills later in your adventures, you take the penalty to Mind at that time. Example: A human ranger with an 18 Wisdom (the character’s highest score of Charisma, Intelligence, and Wisdom) would have an 18 Mind and a 90 Sanity. With training in Knowledge (dungeoneering), the ranger’s Mind drops to 17 and Sanity to 85. Forbidden Tomes. Reading forbidden tomes can also directly affect your Mind (see Forbidden Knowledge below). Horrible monster? Where? Ah, you’re just seeing things. Benefit: Your Mind save is a “fast progression” or “good” save (like the Will save of a cleric or the Reflex save of a rogue). Normal: Your Mind save is a “slow progression” or “bad” save (like the Reflex save of a cleric or the Will save of a rogue). Though it’s knowledge that likely got you into this mess to begin with, you perversely have greater access to the secrets of the multiverse. Benefit: When you are suffering from temporary or indefinite insanity, you can use your Intelligence modifier in place of other ability modifiers when making skill checks. For skills that already use your Intelligence modifier, it is doubled. Your wisdom shores you against what threatens to break your mind. Your powerful presence provides your last, best defense against the coming madness. Benefit: Treat your Charisma modifier as temporary Sanity points. Temporary Sanity points function for Sanity just as temporary hit points function for hit points. They last until you rest. In other words, you gain your Charisma modifier in temporary Sanity points for each day. The highest Sanity you can ever have is five times your current Mind (or 5xMind), barring a feat such as Deep Wisdom that increases your sanity beyond its normal limit. If your Mind increases or decreases, your maximum Sanity is adjusted accordingly. Your Sanity (and to a lesser degree your Mind) will likely fluctuate constantly as you adventure. It is primarily decreased by failing Sanity checks and increased by various rewards and healing. Your Mind save (a sister save to Fortitude, Reflex, and Will) is a “slow progression” save (like the Reflex save of a cleric or the Will save of a rogue). The DC for a given Mind save is decided entirely by you: it is 10 + 1/2 your HD. A success means you take no or minimal Sanity loss; a failure means you automatically suffer some Sanity loss, depending on the trigger. Your Mind save (or Sanity check) is often more difficult than a standard save; penalties abound. You suffer a -1 penalty to Mind saves for every 5 points of Sanity you are below your maximum Sanity. (For example, if you have 90 maximum and are currently at 70 Sanity, you suffer a -4 penalty: 90-70 = 20, divided by 5 is 4.) In addition, you suffer a -2 penalty to Mind saves if you are currently afflicted by a temporary disorder and a -5 penalty to Mind saves if you are currently afflicted by an indefinite disorder. If you have 0 Sanity remaining, you automatically fail all Mind saves. As you encounter certain creatures, perform or witness certain acts, or learn certain knowledge, you risk losing your mind. Two key factors determine which creatures trigger Sanity loss and how much Sanity is lost: their type and their HD. Generally, creatures of increasingly alien composition and disposition strain your faculties and, possibly, force you to make Sanity checks when you encounter them. Sanity Loss. If you fail a Sanity check, you take the Sanity loss listed after the creature type below. If you succeed a Sanity check, you may still take some minimum Sanity loss: you take 1 point of Sanity loss for every 5 HD the creature is greater than you are and you take 1 point of Sanity loss if the creature is an aberration. Inured. You can become inured to creatures with successful Sanity checks: sometimes one, sometimes two, sometimes three. Once inured, you no longer need to make a Sanity check simply on encountering that creature. Once inured to a creature, you may also be inured to others like it, providing they’re of the same type and HD range. For instance, if you become inured to one skeleton, you would likely also be inured to another skeleton of the same type and HD range, but you would have to make additional Sanity checks against skeletons of a different type and HD range. This is not a hard rule, however, for you would certainly not be inured to all demons or all dragons, for example, just for inuring to one specimen because these groups are so broad and divergent. Natural Creatures (animals, humanoids, plants, vermin). The creatures of the natural world do not intrinsically trigger Sanity loss: they are automatically inured to their own kind. Natural creatures define the normal warp and weft of reality. Preternatural Creatures (constructs, fey, magical beasts, monstrous humanoids, oozes). Preternatural creatures are inextricably linked to our world and share many similarities. While they are still quite different, they do not intrinsically trigger Sanity loss in natural creatures. Natural creatures are automatically inured to preternatural creatures. Preternatural creatures are automatically inured to natural creatures and to other preternatural creatures. Dragons and Outsiders (1d8). The multitude of planes that comprise the multiverse tend to be extremely different from the natural world. Simply encountering a dragon or outsider triggers a Sanity check. Dragons are a special case, however. Dragons are always powerful and mysterious, but in some worlds, they are relatively common. If dragons are rare creatures in your world, leave them in this category. However, if they are more common in your world (perhaps even commonly serving as pets and mounts), they should instead be considered preternatural creatures. Natural creatures can become inured to dragons and outsiders, but it requires two successful Sanity checks. Preternatural creatures can become inured to dragons and outsiders with only one successful Sanity check. Dragons and outsiders are automatically inured to natural and preternatural creatures. They are also automatically inured to others of their own type but only those less than 5 HD greater: the multitude of planes are much too diverse for anything more. Dragons and outsiders can inure to other dragons and outsiders with one successful Sanity check. Undead Creatures (1d8). Undead are a breed apart. No normal living creature is completely comfortable around them. No matter what they once were, there’s just too many disturbing thoughts and emotions that arise from one’s proximity to death. Encountering undead triggers a Sanity check. Only aberrations are automatically inured to undead. Other creatures inure to undead with three successful Sanity checks. Undead are inured to everything. This means that intelligent ghouls and other possible undead PC races are never affected by Sanity losses other than atrocities. Aberrations (1d12). Aberrations define madness. They are nightmare made whole. Aberrations trigger Sanity checks in all other creatures (other than aberrations and undead). Even on a successful Sanity check involving an aberration, you take at least 1 point of Sanity loss. Other than aberrations and undead creatures, no creature can become inured to aberrations. Aberrations are inured to everything. The Sanity loss a creature can cause you is multiplied by every 5 HD it is higher than you are. Therefore, creatures less than 5 HD greater than you gain no Sanity loss multiplier; creatures 5-9 HD greater than you multiply any Sanity loss caused by two; creatures 10-14 HD greater than you multiply any Sanity loss caused by three; creatures 15-19 HD greater than you multiply any Sanity loss caused by four; and so on. Magic. A little knowledge can be seriously detrimental to your wellbeing. Generally, though, standard magic—whether through spells, incantations, or items—should not trigger Sanity checks. Simply stated, it’s too abundant in the game. However, there are always exceptions. As example, incantations that have you contact or witness other creatures or events should be treated as if you actually encountered the creature or witnessed the action. Forbidden Tomes. The truly horrible and best-left forgotten knowledge that is typically reserved for dusty tomes is most appropriate to artifacts, eating your sanity as you indulge in every last page. Typically, these tomes will grant you bonuses to knowledge and, perhaps, access to new spells and incantations, but it’s always at a cost. These artifacts most commonly reduce your Mind directly—by either a set or a variable number—instead of simply reducing your Sanity. There are a handful of ways to regain lost Sanity, and each has its own level of risk and reward. Mind. If your Mind increases during adventuring, your maximum Sanity increases accordingly (but not your current Sanity). All creatures benefit equally from Mind increases. Victory Rewards. You regain Sanity when you defeat creatures that you’re not inured to: 1d4 Sanity regained for defeating dragons, outsiders, and undead creatures and 1d6 Sanity regained for defeating aberrations. Healing. Call it what you will—convalescence, spirit healing, witchcraft, exorcism, or (more modernly) therapy—you occasionally need a bit of assistance in recovering your faculties. Once per week, you can try to regain your lost sanity in this way. The entire week must be a respite from adventure, spent in convalescence with another character who is trained in Heal. That character makes a single Heal check opposed by your highest skill of Knowledge (arcana), Knowledge (dungeoneering), Knowledge (planes), or Knowledge (religion). If the Heal check is successful, you regain 1d3 Sanity. If the Heal check fails, you gain no Sanity. If the Heal check fails by 10 or more, you permanently lose 1 point of Mind as the memories resurge; your maximum Sanity will need to be adjusted accordingly. Despite the resiliency of the mind and its capacity for growth and repair—or at least blocking out the awful bits of memory—not all creatures are equally good at it. Natural creatures (see Creatures above), though most fragile, have the most flexible of minds and regain Sanity normally as detailed above. Those of other types, however, have minds slower to both break and mend: preternatural creatures (see Creatures above) regain 1 point less per die (regaining a minimum of 1 point) from drugs, healing, and victory rewards and dragons and outsiders regain 2 points less per die (regaining a minimum of 1 point). Stay tuned tomorrow for part 2 when we finish off your brain for good! Bachelor #2, if you were a frothing monstrosity from the darkest depths of my nightmares, where would you take me on our first date? Thanks for the Pathfinder support. I like the CoC-derived kind of Sanity mechanic for D&D, and have been known to use it myself. Two comments – one, I think the SAN hits are a little high (esp. comparing to actual Mythos creatures in d20 CoC…) and I’d tend to bump them down a die size. Two, which isn’t the fault of the article, is that creature types are used in extremely inconsistent ways. Heck, the new shoggoth in the Pathfinder Bestiary is an ooze, while the delicious-with-butter reefclaw is an aberration. Oh, and I really like the “Atrocity” hits and think in a D&D campaign where people say “monsters, whatever” this is the real place to focus. I think it should be expanded a lot – I notice there’s “witness a murder” or “get tortured” but frankly PCs tend to commit murder and/or torture, it’s great to hit them with SAN loss for it.